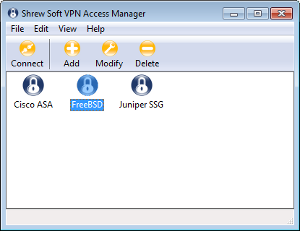 The VPN Access Manager with a single Site Configuration Defined. To initiate a connection, highlight the site you wish to connect to and click the Connect toolbar button or select Connect from the dropdown File Menu. You may alternately right click on the site you wish to connect to and select Connect from the popup context menu. Double clicking on the site icon will also perform the same action. To create a new site configuration, click the Add toolbar button or select Add from the dropdown Edit Menu. You may alternately right click inside the site list window and select Add from the popup context menu. When the Site Configuration dialog appears, enter all the required settings for your new site. After you have finished, a new icon will be added to the site configuration list. To modify an existing new site configuration, highlight the site you wish to modify and click the Modify toolbar button or select Modify from the dropdown Edit Menu. You may alternately right click on the site you wish to modify and select Properties from the popup context menu. When the Site Configuration dialog appears, modify all the required settings for the existing site. To delete an existing site configuration, highlight the site you wish to delete and click the Delete toolbar button or select Delete from the dropdown Edit Menu. You may alternately right click on the site you wish to delete and select Delete from the popup context menu. Confirmation is required before a site is permanently deleted. To export an existing site configuration to a file, highlight the site you wish to export and select the Export option from the dropdown File Menu. You will be prompted to select a location and file name for the exported configuration. To import an existing site configuration from a file, select the Import option from the dropdown File Menu. You will be prompted for the path and file name of the configuration to be imported.